Selected Rings, Pendants and Talismans made available to Gemstoneuniverse.com patrons in February 2011. Comments In the Vedic texts Mangal or Kuja or Mars is known to be the commander of the army of Gods! That’s the power associated with this planet! It is also the planet of Courage and controls the blood system in the body! This Organic Red coral embodies all these essential attributes of the planet Mars! 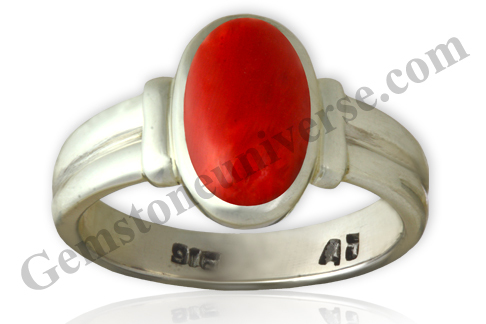 A Sattvik and powerful Jyotish talisman set in a sterling silver ring!